The Huawei Ascend W1 is a Windows Phone 8 midrange smartphone announced in January this year and reviewed by us at the end of the spring. It’s priced at about $229 in USA at Walmart, but you may find it for even lower prices. This model can be placed more or less on par with the HTC 8s and Lumia 820 and actually we did a comparison of those 3 models. The Huawei Ascend W1 measures 10.5 mm in thickness, weighs 130 grams and it’s quite bulky if you ask me. It’s got an ugly chin and the camera area reminds me a lot of the HTC One X for some reason. This model offers good grip and feels really solid, so it could survive a drop on the pavement. It has decent build quality in spite of relying on plastic as the main material. I should also mention that this handset is not rounded and uses straight angles for its design. 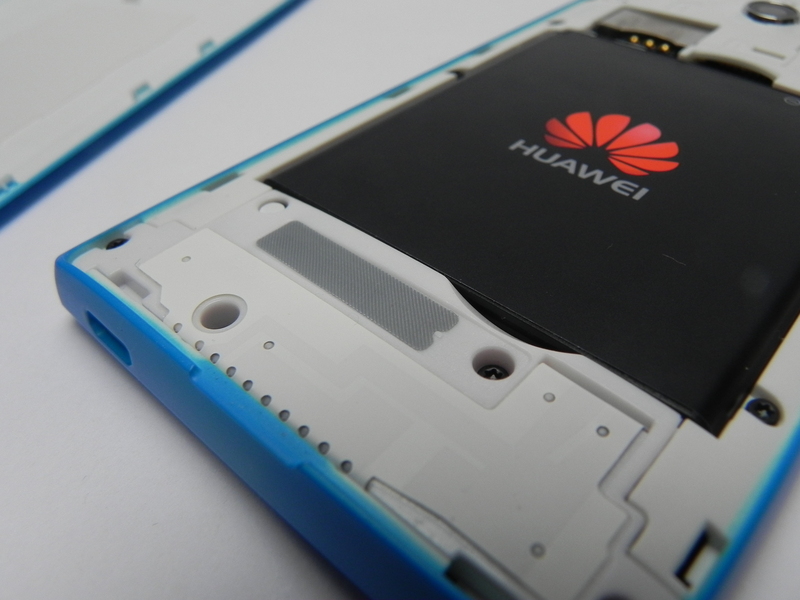 Huawei W1 is available in black or blue and it’s made of polycarbonate mostly. Its specs include a Qualcomm Snapdragon MSM8230 dual core 1.2 GHz processor, an Adreno 305 GPU and a 4 inch 480 x 800 pixel display. This is an IPS LCD screen with 233 PPI pixel density and other specs include 512 MB of RAM, 4 GB of storage (1.5 GB user available), WiFi dual band, DLNA, Bluetooth 2.1 and microUSB 2.0. At the back we’ve got a 5 megapixel camera with LED flash and 720p video capture, while upfront there’s a VGA shooter, which is certainly an upgrade from the HTC 8S, that lacked a front camera. We also get HSDPA 21 Mbps on this model, an accelerometer, proximity sensor, GPS and Glonass. The battery inside the phone is a Li-Ion 1950 mAh unit, that on paper should provide 460 hours of standby functioning and 10 hours of 3G talk time. We were actually impressed by the battery, that provided about a day or a day and a half of functioning time. Moving to the audio, the headphones are pretty comfortable to use, but they’re much weaker than those provided with a Nokia Lumia model. Also, they tend to easily come out of the user’s ear. The speaker is loud, but distorted when you increase the volume. The voice is warm, but the bass is weak and the headphones’ sound is slightly muffled and metallic. On the video side, we’ve got a screen that’s not as bright as many other WP8 devices, it has a low black level and bad sunlight behaviour. View angles are decent and Huawei relied on one glass screen technology here. The colors are realistic and the device supports H.264 playback, MP4 and WMV. Overall, the screen is slightly washed out, sadly. The camera at the back is a 5 megapixel unit with autofocus, LED flash and slow focus. We’ve got options like ISO and white balance available and the pics are easily burned in the sun and oversaturated. The LED flash triggers red-ish shots at night or in low light conditions and the pictures are pretty noisy. The video capture is reasonable for a 720p 30 FPS recording and audio is also decent. There are slight focus issues, but the clarity is good. On the benchmark side, this model is better than the HTC 8S in AnTuTu, with 3000 points more. Huawei scores 9383 points in AnTuTu, 1732 points in Browsermark, even beating the Lumia 820 and 1125 poins in SunSpider, which is not that impressive, since it’s beaten by most Lumias. We’ve got a reasonably fast browser and WP8 means we get resizable tiles, Kids Corner, People Hub with Rooms and more. There’s Office for productivity and the voice quality of the phone is OK, in spite of the low volume. Bing Maps handles your directions and we also showed you Windows Phone Store for the apps. And now the Pros and Cons! We give the Huawei Ascend W1 a 7 out of 10 for design, a 7 for hardware and a 7 for OS and UI, for a total of 7 out of 10, as the final grade. We wished this smartphone would be better, especially with its low price, but sadly we found it lacking in many areas, something that Nokia wouldn’t allow on any Lumia, no matter how cheap.